Worshipping anything other than God is idolatry. Martha and I just returned from three conferences in Spain. I was teaching about Christ Centred Inner Healing and also counselling leaders and attendees. We were treated like family. Carmen Gallego, our leader, organized three amazing events and we felt blessed to be invited to teach, and with Carmen’s translating, counsel. I love sharing the Good News that Jesus’s Truth sets us free. My book “Broken Hearts and Wounded Souls” was translated into Spanish and made available to each participant, once again thanks to Carmen. 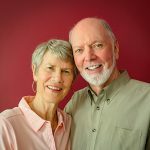 Deene and Phil Webb also translated and taught from their 30 years of experience in Medellin, Colombia. Martha and I were blessed by the experience.